By popular demand, Stubborn Records is extremely proud to present the first official-release live recordings from King Django. "Brooklyn Hangover" represents a tight set from the heavily-touring, hard-grooving King Django Quintet lineup of 2007-- King Django on lead vocals, ukulele, harmonica, melodica and trombone, Justin Rothberg on guitar, Jess DeBellis on keyboards, Ira Heaps on bass guitar and Gregg Mervine on drums. 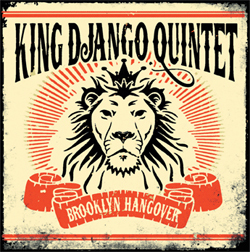 Tight, stripped-down versions of classic King Django tunes spanning his long career (including Stubborn All-Stars, Skinnerbox, Roots & Culture, et al.) really let you hear what Django's all about as a songwriter, vocalist and instrumentalist. With a serious hangover, no less! Talk about intimate! It's the closest you can get to having a King Django Quintet concert in your living room! Recorded live at Southpaw in Brooklyn in 2007 and mixed and mastered by King Django at Version City, the sound quality on this release is so excellent that most people who've heard it sort of don't believe that it's live!